Yes yes yes! It’s some raw vegan goodness comin’ atcha! 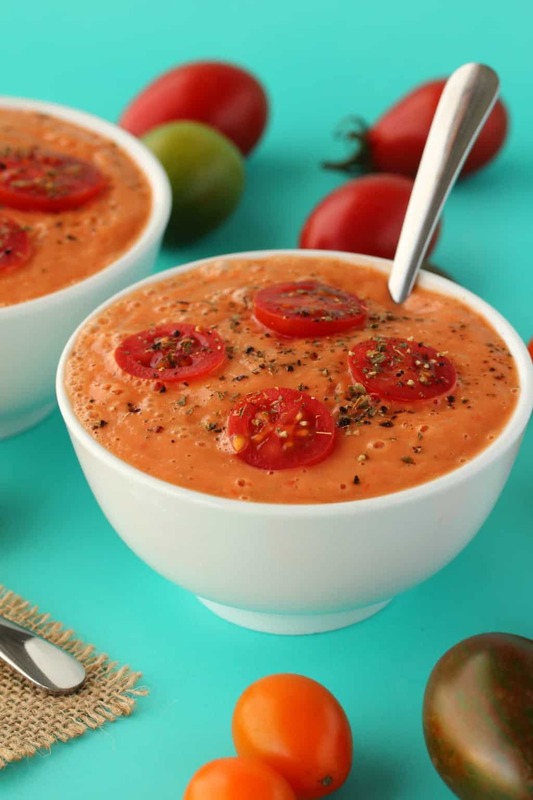 It tastes like heaven on earth, the freshness and flavor of this creamy raw tomato soup simply explodes out of this dish. 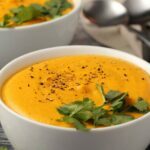 Other than making glorious smoothies, making raw vegan soups is a personal favorite. And it’s a favorite because it’s just so easy! And I’m a big fan of easy. 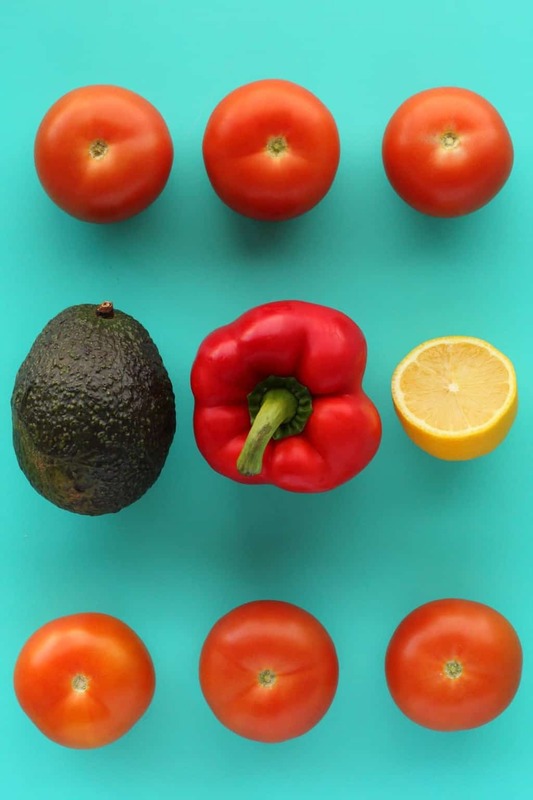 Here we have a few simple ingredients, you chop them up (any which way, they’re just getting blended anyway! ), throw ’em in a blender and there you have it! 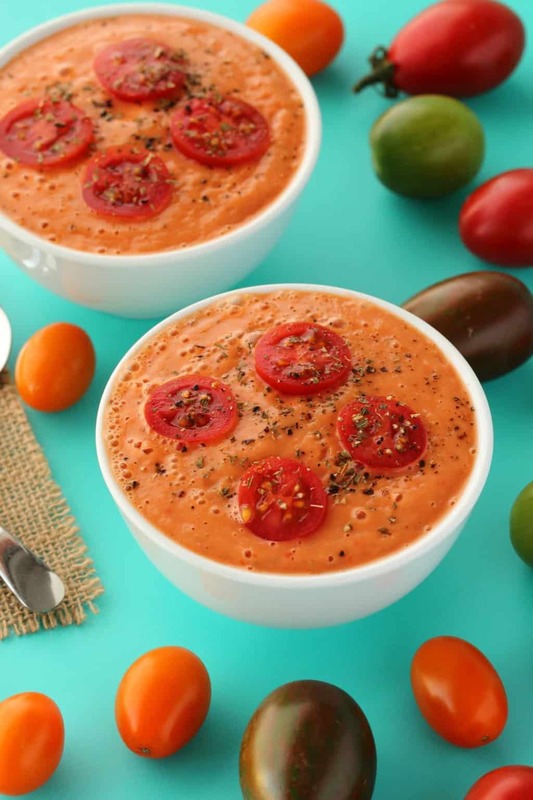 A thick, creamy delicious tomato gazpacho that’s ideal as an appetizer. Or, you know, you can just have it in place of a salad anytime you don’t feel like doing too much chewing. 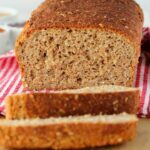 Yip – it is the lazy person’s food. And I relate because sometimes salads just are too much chewing (and also….I’m lazy sometimes). 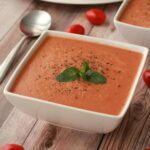 With just enough spice added to provide the va-va-voom to these fresh ingredients, some cherry tomatoes for garnishing (or to mix in with the soup as well, fresh crunchy cherry tomatoes are just so good), and you have yourself a gourmet starter course. 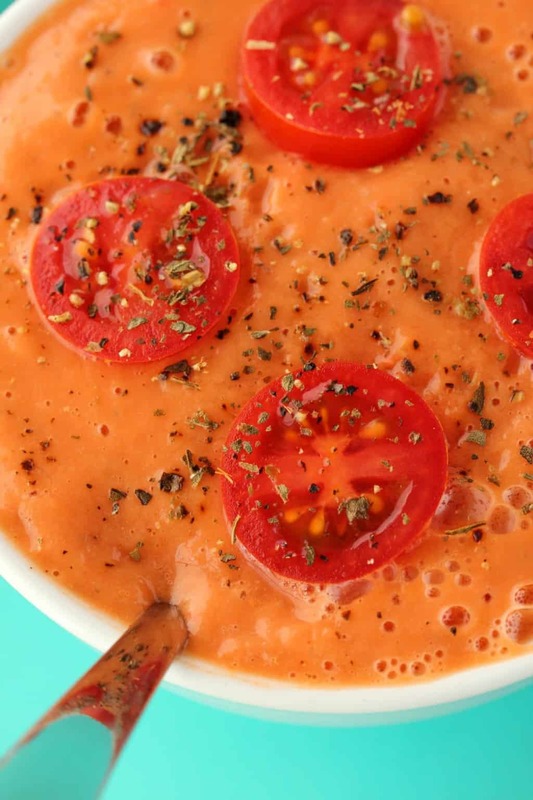 This is a soup that you want to eat right away. I am not one of those who understands the ‘make it now eat it days later’ mentality when it comes to really fresh ingredients. It just doesn’t work. 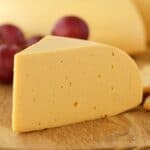 Fresh, uncooked ingredients oxidize….quickly. They’re healthiest when they’re freshest and they’re also the most delicious. 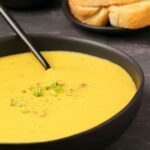 I used to make myself raw soups when I was working in a corporate office. 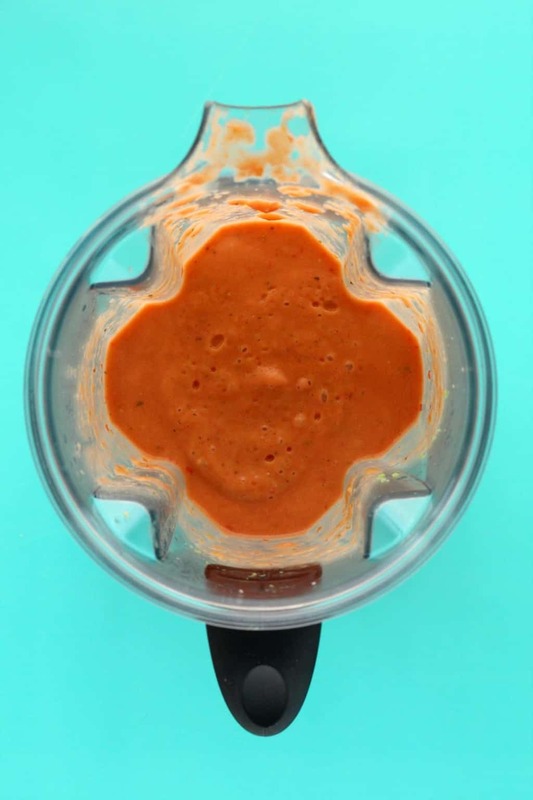 I had already bought myself a blender especially for the office, that lived in the office kitchen and I would just take the ingredients along with me, and blend it up at lunchtime. Serve it right away as this is not something you can keep. 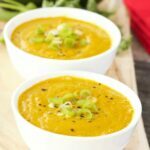 The beauty of this dish is in its freshness, so blend and serve! 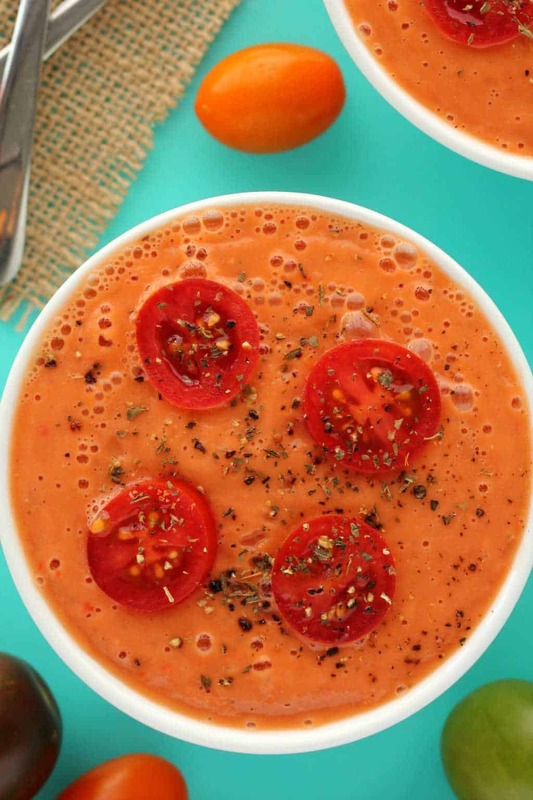 Let us know what you think of this raw tomato soup by leaving a comment and rating the recipe too! Thank you! 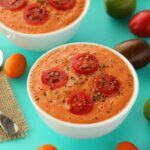 If you’re a fan of of a good gazpacho definitely check out our watermelon gazpacho and our carrot and avocado gazpacho! 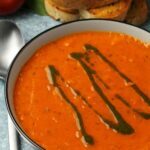 And if you love tomato soup, then also check out our vegan tomato soup (the cooked version!). 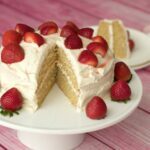 Sign up to our email list while you’re here, you’ll not only be the first to know when new recipes are posted to the blog, you’ll get an awesome free recipe ebook too, containing 10 delicious vegan dinner recipes! 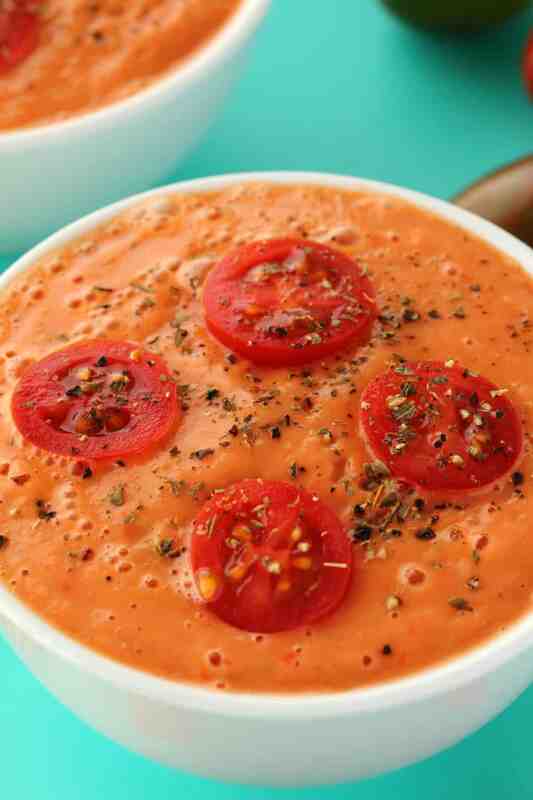 Deliciously creamy raw tomato soup. 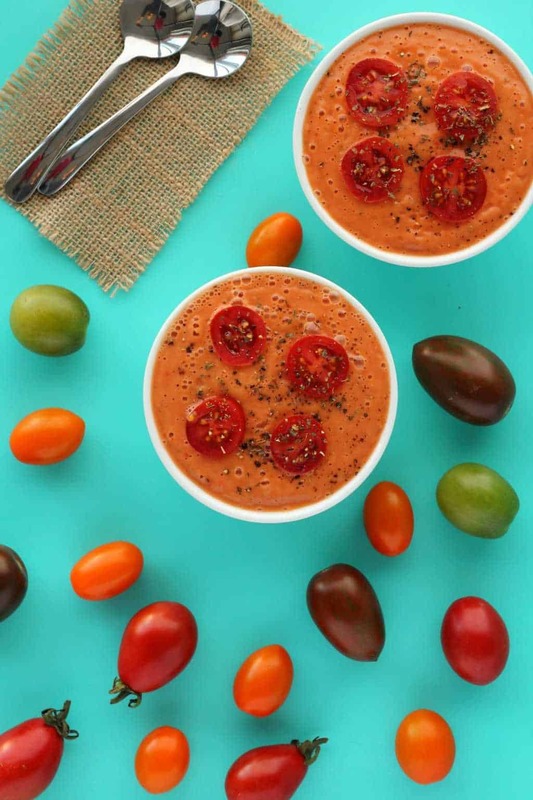 Made entirely from fresh raw ingredients, this tomato gazpacho can be whipped up in 5 minutes and is as gourmet as it gets. Ideal as an appetizer. 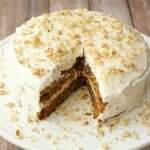 Raw, vegan and gluten-free. 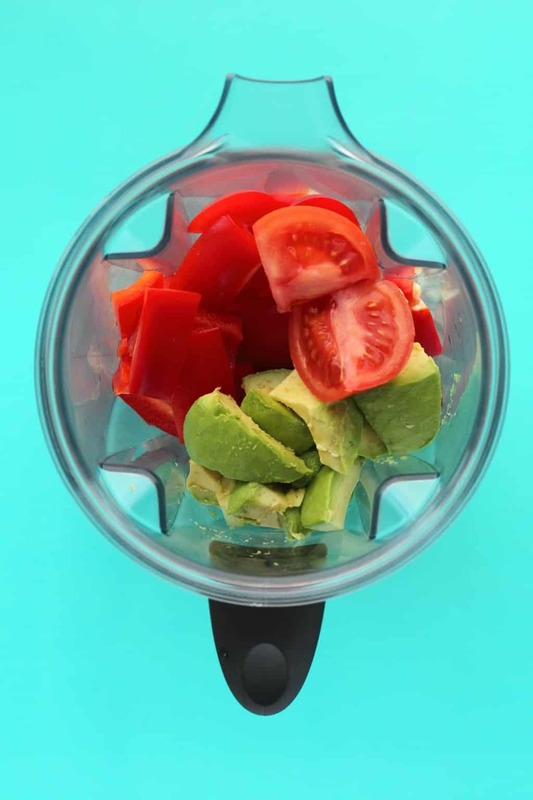 Chop the tomatoes and red bell pepper and add to the blender along with the lemon juice. Peel and core the avocado and add the avocado to the blender. Add the dried basil, oregano and crushed garlic. Garnish with sliced cherry tomatoes and a sprinkle of black pepper, dried basil and oregano. Yes, it’s so great when that happens! Hope you enjoy this version! 🙂 Coconut cream sounds awesome too. How do you know when it’s not over 118 degrees? Hi Viki, I’m assuming you mean for keeping foods raw while heating them? You would gently warm foods on a stove until they’re warm, way before the point of boiling or simmering. And if using a dehydrator you would set the temperature to below this. Usually you would dehydrate at around 105 degrees so it’s equivalent to ‘sundried’. I luv it, thanx a ton! Do you think I could make this without the red pepper? Any substitutes? Thanks! 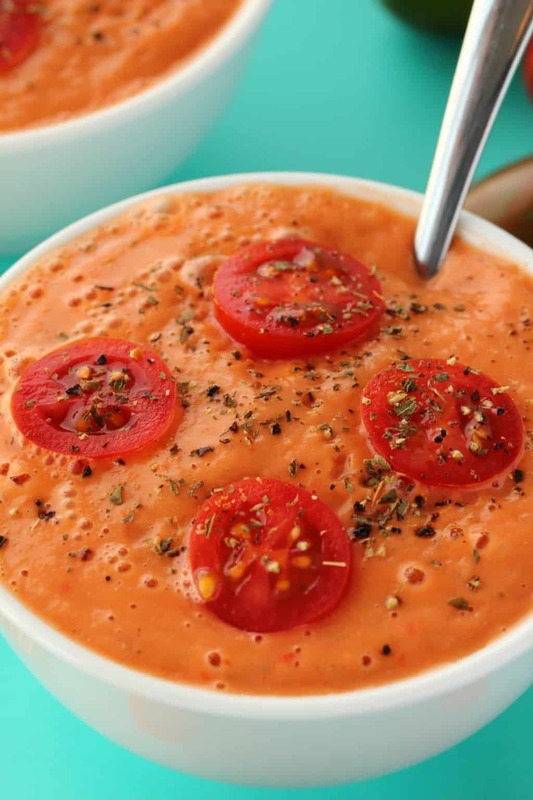 I added an extra tomato instead of the red pepper and the soup turned out great!! 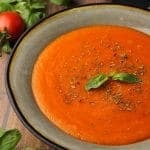 My 11 yr old son has been asking for tomato soup and he said that this one hit the spot!! Thank you!